Situated high on a bluff with sweeping, uninterrupted sunset views of Lake Michigan, the Manitou and Fox Islands, Pyramid Point and Whaleback, Viewtopia is just that…the dream vacation get away. 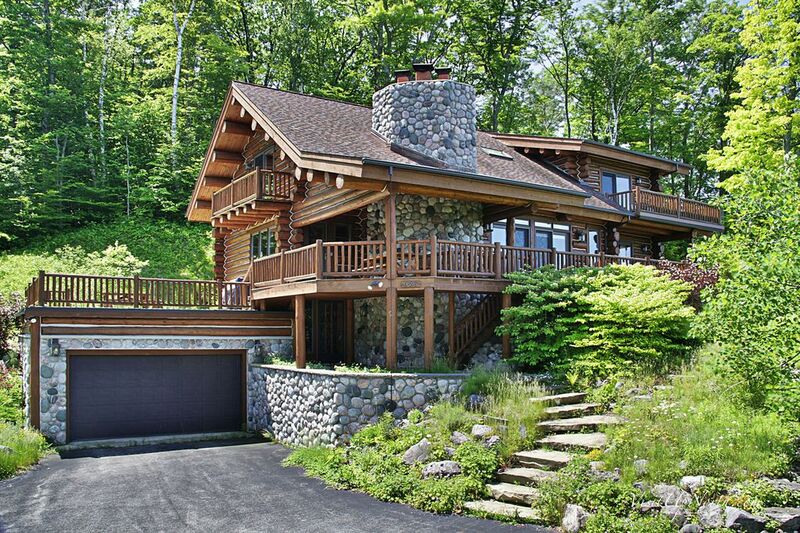 This majestic log home is reminiscent of a National Park lodge with 3 levels, 4 bedrooms, and 3.5 baths. Master suite on lower level with queen. Upper level has 3 bedrooms (1 with king, 1 with queen, 1 with a twin and a bunk bed). Sleep up to 11. Fully equipped spacious kitchen with gas cooktop/oven. Home features stone fireplace, skylights, central air conditioning, washer/dryer, 2 car garage. There are board games, puzzles, books and a foos-ball table for a little friendly competition. Cable TV/DVD/WIFI. Sheets and towels included. 2 outdoor charcoal grills perfect for preparing meals on the multiple decks, equipped with 4 reclining spa lounge chairs, comfortable outdoor furniture, and 2 picnic tables.No outdoor fires are ever permitted. 6 person hot tub. This spectacular property is less than a 10 minute drive to Good Harbor Beach on Lake Michigan and Sleeping Bear Dunes National Lakeshore Park. Sleeping Bear Dunes was voted by the viewers of Good Morning America as "the most beautiful place in America". The area hosts art, music, and special focus festivals during summer and fall. Wineries dot the landscape and wine tours are available as well as plays and concerts at nearby Interlochen Music School. Leland, Glen Arbor, Suttons Bay, and Traverse City are within an easy drive and offer upscale resort shopping, charter fishing, restaurants, casinos, golf, and mini-golf. A beautiful and relaxing dream vacation come true. This is a Friday-Friday rental for prime summer weeks. Short stays available during off peak seasons. Arrival and/or departure date must back up to existing reservations and/or begin/end on a Sunday. Memorial and Labor Day weekends require three nights. Good location, great place had a good time. Needs deep clean and some basic maintenance though. This log home is beautiful with plenty of room Kitchen is large, bedrooms are roomy, and the deck space around the home is excellent. Great for BBQ, laying out, partying. But the best is the view and sunsets over Lake Michigan and North Manitou Island. This rivals beachfront settings in Hawaii. It can't be captured in a photo! Yes, it's called Viewtopia so you figure it must have a good view but let me tell you, no photo can truly capture the panoramic beauty that is yours at sunset!!! The view stretches from Pyramid Point in the south to Whaleback in the north taking in both north and south Manitou islands. The home is amazing with views from every window and a hot tub on the hill!!! Our family (just 6) has rented Viewtopia for a number of year sand we're always amazed by the view! A beautiful spot and perfect cabin. Absolutely amazing home. Comfortable and relaxing. So wonderful to wake up to expansive views of the water. Hot tub was a welcome perk after a long day of touring the peninsula. Highly recommend. Viewtopia definitely lives up to its name! We look forward to your next stay here. This place was gorgeous! such a fabulous view of the water, which is only a few minute hike away! The balconies lend to perfect views of the sunrise/sunset and the open concept allows for a fun environment. I would definitely go back! LELAND features Historic ���Fishtown” and a large harbor with many charter boats for catching salmon and lake trout. Great shopping and dining are also found on Main Street and Fishtown. Enjoy the local artisan bread shop and art galleries, candy shops and more. Daily trips to the Manitou Islands from Leland Harbor and there are festivals throughout the summer and fall!